My girls (Andie's aunties from LA) flew up and drove over to spend time with TL, Andie and I this weekend and it was so amazing to have them here. We vegged out and caught each other up on our lives. 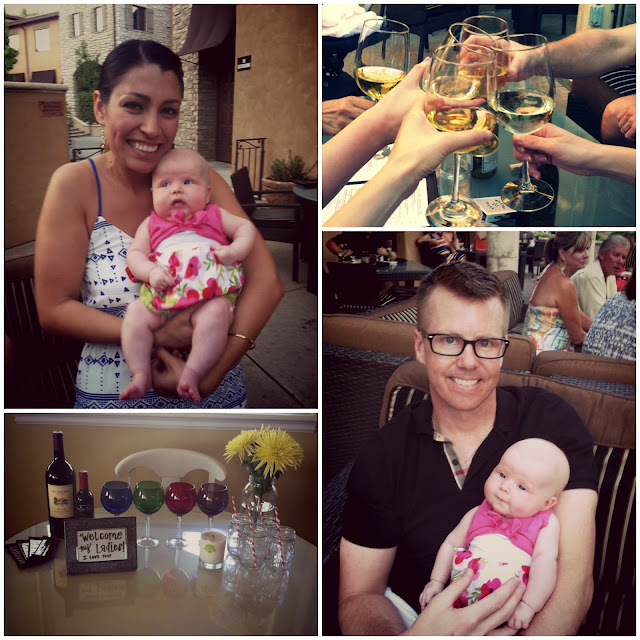 We ate dinner and listened to music on the patio at a local restaurant. We played the card game hi-low and enjoyed a beautiful warm night. So much fun! We went to the Farmer's Market and ate brunch just the 4 of us before they headed home. This weekend was just what I needed. I treasure these girls so much and am beyond thankful for them! We've known each other since college... I can't believe how far life has taken all of us. The band at the restaurant was really good! So thankful for these girls... and looking forward to seeing them again very soon! Looks like it was a great girls time! I love the stripes on Andie's car seat canopy! Where did you get that?! Looks like a blast! Andie is lucky to have such wonderful aunties! And I love your dress!!! Girls weekends are always so good for the soul and I bet they all enjoyed spending time with both you and little Andie :) Love the photo of you, TL and A... such a gorgeous family of three! Such a FUN weekend! I love your strapless maxi! Where is it from?? Girls weekends are the absolute best. Looks like you had a great time! weekends like that are so necessary! Sooo fun!!! I love a girls weekend!! So fun that they came to visit you and Andie! You look fabulous! I'm sure your heart is full after that fun weekend! How fun!! What a fun weekend! And you look amazing!! !